Our eyes are very precious, isn’t it? Imagine somebody using a hammer over it That’s be painful, for sure? Now imagine somebody drilling into your skull. You are getting the picture, right? That’s how it feels when somebody has a migraine. On good days the pain only resembles a mild throbbing around the eye and head area; otherwise, it’s extreme with an ever increasing pressure from inside the head. At this moment there is a general feeling that the pain will never go away, slowly becoming a part of your routine, keeping you tensed about its arrival, which may be anytime during the day or night. In the long run, though, you will get used to accepting these migraines as a part of you, amidst pain, chaos and lack of willpower to overcome it, hence trying to live with it. 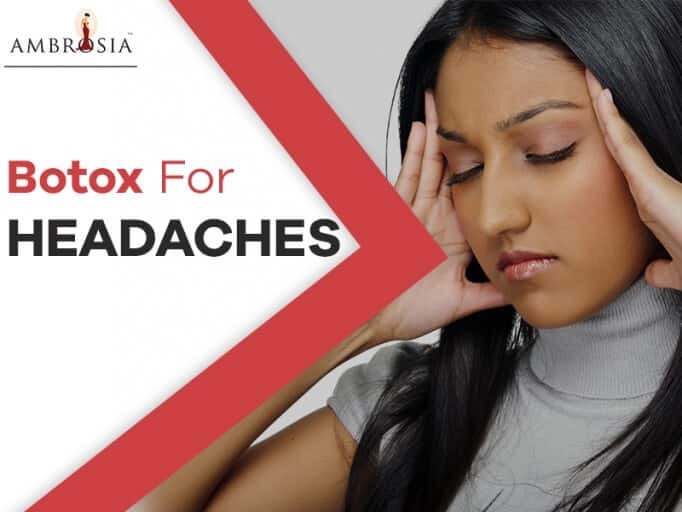 Through modern technological advancements in the medical field, migraines have been looked at keenly with an objective to find solutions in getting rid of the problems altogether. Now, what if we told you that there’s a treatment which might sound unusual at first. If you think botox is just a means to improve your looks, think again. With the improvement in science comes steady progress, and one of those newly discovered treatments include the Botox way for treating migraines. Back in 2010, the FDA approved Botulinum toxin or Botox for the treatment of migraines in adults who suffer from this complication regularly. Chronic Migraines are the form that occurs nearly 15 days in a month for three months. It leads to having headaches for at least eight days in a month. An injectable form of Botox known as Onabotulinumtoxin A is used to treat Migraines. How does Botox work for Migraines? After Botox gets injected into the system, it blocks and prevents the release of brain chemicals like acetylcholine, which causes headaches for people suffering from migraines. Furthermore, it prevents the movement of certain muscles and nerves as well. Although the exact way how Botox reduces headaches and stiffness is unknown; the suggestion is it might be due to Botox blocking the nerves that particularly function by sending pain sensations to the brain and also leads to the relaxation of the muscles, so they become less sensitive to the pain caused in migraines. Botox might be an effective treatment for migraines, but this may not work the same way for everyone opting for it. Botox treatment does not warranty the patient will rid of migraine headaches once and for all. Research well before you opt. Botox, like every other medical treatment, comes with its share of side effects. Although these effects are mostly mild and reversible, some cases have seen adverse side effects. The most commonly observed side effects of Botox are the loss of strength and muscle weakness throughout the body, vision could get blurred or doubled at times, change or loss of voice, struggling to say things clearly, drooping eyelids, uncontrollable bladder, breathing problems or some patients have faced trouble swallowing. If you end with any of the mentioned side effects, be sure to consult your physician immediately. Botox treatment for migraines is for the chronic type of headaches. So, if you are suffering from episodic or headaches caused due to tension, stress or any external factor. Most importantly Botox won’t act as a solution to these problems either. Is the physician experienced enough? This kind of treatment is still picking speed in the market. People are yet to be completely open to this treatment, hence the number of experienced physicians capable of carrying out this treatment is an awful lot less. So it is necessary the doctor is qualified, is an expert in this treatment, and is reputed enough for this. A wrong, inexperienced physician would only cause more trouble on top of the headaches you are already suffering. Bad choices could lead to irreparable damages and more intense side effects if the treatment is to go sideways. The Botox treatment for Migraines is not something done over a few sessions; instead, it turns out to be a long process. It’s important to be patient enough to wait at least 6-9 months to get some result. If you are to opt for this treatment, do not be in a hurry to get results. Patience is also necessary to go through some difficult times during the treatment as well, as the side effects and other symptoms are not the least comforting. There is an individual cost to consider before you get into this treatment. The immediate expenses, long term costs. along with the pain of the injections on offer. Although it’s hard to predict the cost of the entire treatment here, as it mostly depends on your doctor as well as the dosage you would require keeping your condition in mind. Some small benefits come with this cost too, for instance, you’d have fewer wrinkles going forward and a better life with fewer headaches from your migraines. Overall, the treatment has shown positive signs in people who have taken the pains to go through the process. Botox for Migraines is a new age treatment with modern medical science taking the lead. Although one cannot predict how this treatment would conclude, it is imperative you know about it beforehand rather than afterwards.